Shivam Paying Guest House is a family run place,right in the centre near the bustling clock tower market.This old house has 8 bright en suite rooms some of the rooms has balcony and are decorated with wall paintings by local artist. Shivam's roof offers a dazzling sunrise view of the fort. The hotel has several floors capped by a two-tier restaurant which exemplifies Indian's rooftop culture. The lower tier is covered by the upper and equipped with air conditioning units, making it a great place to shelter from the midday heat. The restaurant is clean and the food is tasty and cheap. On the menu youll find continental dishes like tomato and cheese sandwiches, as well as traditional Indian fare, including several varieties of rice, a plethora of curries and the necessary flat bread to gather them up with. Palak Paneer (spinach and goat cheese) and Kashmiri Dum Aloo (potatoes in a yogurt gravy) are particularly good washed down with a cool sweet lassi. 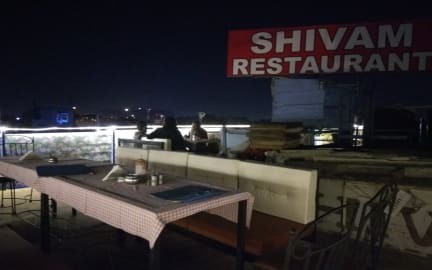 The roof top restaurant has a panoramic view of the fort and blue city.Shivam's restaurant and espresso cafe is quite popular among the tourist.After being in the top guide books of the world for so many years we are personally look after our property to provide better services to our guests. Shivam's exceptionalism is far reaching. we are one of the few small hotels in India in where one does not have to contend with ants or roaches. Our establishment demonstrates a deep understanding of western comfort. Hotel sympa, belle vue du rooftop, chambre propre, nourriture variée et personnel très aidant, bons conseils, je recommande. Stairs are steep but the roof top view is a winner. Staff have been great to us too. Absolutely loved this cute little guest house. Food and service were amazing, had a very nice mom and pop feel to the place. View is incredible. Great location, just between the clock tour and the fort. I enjoyed my stay at this guest house. The location was amazing; it was close to several things so I could walk to where I wanted to go, and the owner was very helpful in giving us information. The food was good as well. Even when the hostel owner made a mistake in our booking, he was very nice and still found us a room to stay. I felt like this was also a safe place to stay. Convenient location between the clock tower and fort. Great view of the fort from the rooftop restaurant. Large and clean private room with natural light through windows. Friendly staff and helpful mini-introduction to the city and tips for getting to the fort. Overall, very happy with our short stay. Greate location. However, no hot water and so loud at night (could not sleep). Is alright but not the most comfortable place for India. We arrived at the hotel to find the room hadn't been cleaned at all since the last residents, the toilet bowl and floor was covered in disgusting stuff, the bed sheets were dirty, there were two used condoms (from 2016) in the bedside drawer and the fan didn't work. We asked the owner about all these problems before the bill was payed and he commented that 'his 5 staff didn't have enough time to clean the two rooms they have open' and 'we wouldn't understand the situation as we are white.' Not as advertised.